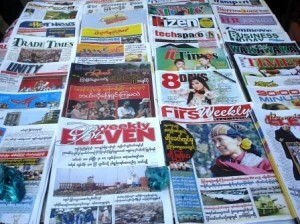 Going against its own Press Council, parliamentarians in Burma have passed a restrictive new press law that will restrict freedom of the press, Mike Harris reports. On 4 July, Burma’s lower house of parliament (Pyithu Hluttaw) passed a restrictive press law that will restrict freedom of the press and kept in place many of the most draconian elements of the existing legal framework. The Printing and Publishing Enterprise Law, drafted by the Ministry of Information, renews the government’s power to license newspapers, news websites and foreign news agencies and has strict rules on obscenity and the incitement of public disorder. The Ministry of Information’s draft law has been viewed by members of Burma’s fledgling press council as an attempt to undercut their attempts to formulate a new press law. Burma’s Press Council was founded by the government in October 2012 with the intention that journalists, their trade unions, media owners and civil society stakeholders should develop a new press law. After a disappointing first attempt at reform, the Press Council is currently working on a second draft of its law. In the meantime, the Ministry of Information drafted its own press law, aimed at undercutting the more open and inclusive process undertaken by the Press Council. While abolishing some of the prison sentences under the old Printing and Publishing Enterprise Law (1962), the law keeps criminal sanctions as well as excessively high fines for media organisations breaching the law. After the publication of this law, Burma’s increasingly vocal civil society launched a public campaign to prevent the adoption. The Press Council sent letters to the president and the Speaker of Parliament setting out their objections to the proposals. It seemed that parliament was more responsive to the demands of civil society when after coordinated pressure, the Chair of Parliament’s House of Representatives Sports, Culture and Public Relations Development Committee (and Vice-Chair of the Union Solidarity and Development Party), Thura Aye Myint, said the law needed reflecting upon and it would not be debated in this session of parliament. Yet, just three months later, the law was passed by the lower house. “We opposed the press bill when it came out. Then, the minister met with the Press Council. Provisions on printing and publishing are also enshrined in the media bill drafted by the council. So we demanded those provisions be removed from the press bill. The ministry refused it and promised to amend some provisions. But it is not the same as they said when the bill was approved. We have to reconsider dealing with the ministry [altogether]”. Burma’s upper house will now need to consider whether to pass the Ministry of Information’s restrictive law, or consider the Press Council’s proposals when they are finalised. If the Ministry of Information’s press law is passed, it will call into question how serious the government of Burma is in reforming its draconian legal landscape for freedom of expression.